TRAILER TOW CLASS III GROUP -inc: 7-pin wiring harness, 7 to 4-pin wiring adaptor, class III receiver hitch, HD engine cooling, pwr steering cooler, trailer sway control, STONE WHITE, SELEC-TRAC II ACTIVE FULL-TIME 4WD SYSTEM, PWR SUNROOF, PREMIUM GROUP II -inc: 18" x 7.0" aluminum chrome-clad wheels, matching spare wheel, air conditioning w/auto temperature control, air filtration, heated front seats, leather-trimmed bucket seats, manual driver lumbar adjuster, memory pkg, P235/60R18 all-season performance BSW tires, Parksense rear park assist system, 6-way pwr driver seat, 2-way pwr front passenger seat, rain-sensitive windshield wipers, remote start, PASTEL PEBBLE BEIGE, LEATHER-TRIMMED BUCKET SEATS -inc: driver lumbar adjuster, P235/60R18 ALL-SEASON PERFORMANCE BSW TIRES, MYGIG MULTIMEDIA SYSTEM W/NAVIGATION -inc: AM/FM stereo, 6-disc in-dash CD/DVD changer, MP3 playback, hard disc drive, touch-screen display, auxiliary audio input, Sirius satellite radio w/satellite traffic (subscription required), auto-dimming mirror w/microphone, UConnect hands-free communication, EXTRA COST PAINT, ENGINE BLOCK HEATER. 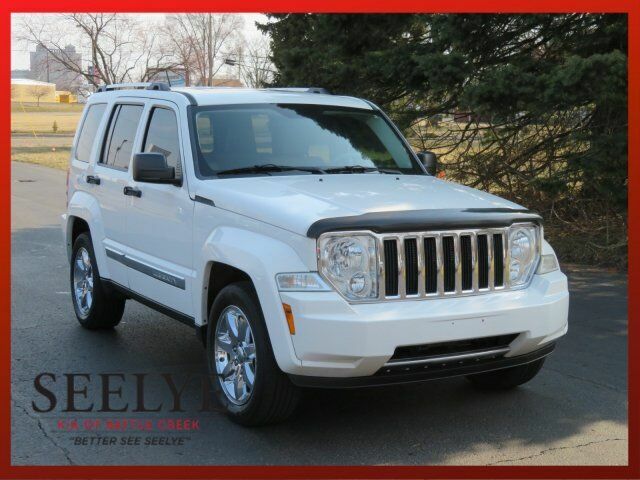 This Jeep Liberty has a powerful Gas V6 3.7L/226 engine powering this Automatic transmission. 28F CUSTOMER PREFERRED ORDER SELECTION PKG -inc: 3.7L V6 engine, 4-speed auto trans, leather-wrapped shifter , 3.7L V6 ENGINE (STD), 18 X 7.0 ALUMINUM CHROME-CLAD WHEELS, Vehicle information center, Variable intermittent windshield wipers, Universal garage door opener, Tire Pressure Monitoring System, Tip start system, Supplemental side airbags, Steering wheel audio controls, Speed sensitive pwr locks, Speed control, SIRIUS satellite radio (subscription required), Sentry Key theft-deterrent system, Security alarm, Reversible/waterproof cargo storage, Removable short-mast antenna, Rear window wiper/washer, Rear window defroster, Rear fascia scuff pad.